Tritsimpida venue consists of cultural heritage for the prefecture of Ileia. Almost two centuries ago, here, in this very place, Marjory danced with Tritsimpidas in a wedding that became a song, dance, legend " In the meadow of Barbasena, Tritsimpidas is getting married, he is wedding Marjory and everyone is full of joy....Who will you marry Marjory...Tritsimpida's son, who has venues in Pyrgos...shops all over Patras..."
Nowadays, what is left of Tritsimpidas, is the aforementioned folklore song and this last part of land, on which the venue was created. It belongs to Anastasios Dimopoulos, Tritsimpidas' descendant. In the folklore song of Tritsimpidas, the name of Marjory is mentioned and thus a short historical flashback concerning her legend, would be useful. 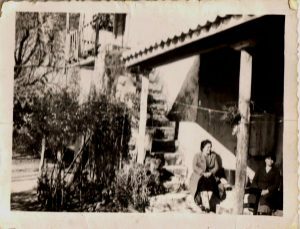 Marjory was a Turkish girl and her real name was Berrije, daughter of Abdala, a rich official of Tripolis. Before his transfer in Tripolis, the official was staying in Barbasena. Just before revolution of 1821, officer Seint secretly sent to Tripolis the chieftain, named karameros Dimitrios, Douros from Lala and other Turkish people to kidnap Marjory as she was heading to the Turkish temple to pray. Berrije was very pretty at the time, tall with black eyes and hair. They took her to Lala, where they kept her prisoner. 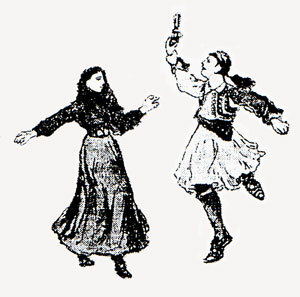 In June ,1821, though, when the Turko-albanians from Lala were defeated by the Greeks, in the battle of Pousi, they abandoned their village and in their flee, they forgot Berrije. The Greek found her, they baptized her and named her Maria. As she was very pretty they called her Marioraia (beautiful Maria in Greek) or Marjory. Later on, she married John, son of Anastasios Tritsimpidas. 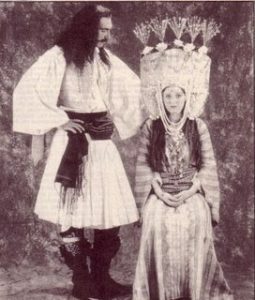 This particular wedding was the social event of that era, something like the wedding of the century and that is why it was celebrated with that popular folklore song. The above historic flashback is a segment from the highly regarded works of Antonios Psarras and particularly from the book "Barbasena", as he, himself came from Barbasena, Ileia. The story of Tritsimpidas and Marjory is accounted in many different ways and folklore stories, like the belief that right after their wedding, Marjory was kidnapped from ,the up to now preserved house, of Tritsimpidas. Whatever the facts are, this wedding will be remembered, thanks to its world known hero, Tritsimpidas.